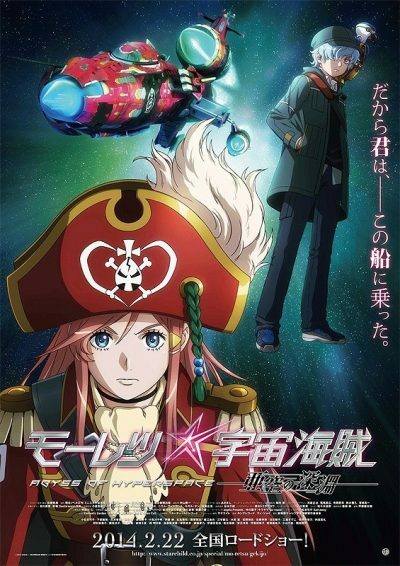 2014’s Mōretsu uchū kaizoku - Akū no shin’en (Bodacious Space Pirates: Abyss of Hyperspace) is the feature-length animated movie follow-up to the anime television adaptation of Saito Tatsuo’s Mōretsu Pairētsu (Bodacious Space Pirates) light novel series. Saito Tatsuo was the film’s writer/director. Sole heir of the notorious space pirate Gonzaemon Kato, Marika Kato assumed her father’s role as captain of the Bentenmaru upon Gonzaemon’s death. The Bentenmaru isn’t the only pirate vessel in the Tau Ceti system, but it may be the only one whose captain has a curfew. Marika is, after all, only seventeen, still in high school, and she needs to maintain her grade point average. Although she insistently refers to herself and her crew as “pirates,” they are privateers. Legal privateering is a curious relic of the system’s colourful history. The war that justified handing out letters of marque is long over (ended when the Galactic Empire1 consumed both Tau Ceti and the power with which it was at war). Rather than serial robbery, murder, and worse, Marika and her crew spend their days giving tourists a thrill by boarding their ships and demanding loot. It’s less a life of crime and more one of deep space cosplaying, one that has been recently complicated by mysterious hyperspace disruptions. While encounters between the Bentenmaru and its targets are carefully orchestrated, Kanata Mugen’s spur–of-the-moment decision to offer himself as hostage to Marika wasn’t planned at all. Kanata is not just an enthusiastic tourist throwing himself into the experience. He’s the only son of a lost (and thought dead) hyperspace explorer; he is being hunted by people determined to find out just what Professor Mugen left to his estranged son. Not only did Marika appear just as his pursuers caught up with Kanata, Kanata knows that Professor Mugen and Marika’s father Gonzaemon were friends. Marika and her crew get a hint of what they are up against when three heavily armed military vessels appear to demand that the Bentenmaru surrender Kanata to them. The vessels themselves are legitimate naval vessels from one of the Empire’s subordinate systems. Some hasty information warfare reveals that the crews themselves are merely posing as the officers who should be in charge of the ships, a detail that will later prove significant. On one side: the Yggdrasil Group, a vast conglomerate controlling almost three thousand companies, a commercial octopus whose reach spans the empire, an organization with an army of mercenaries at its beck and call. On the other, Marika, her retired space pirate mother Ririka, the crew of Bentenmaru and the assembled schoolgirls of the Hakuoh Academy Space Yacht Club. It’s not really a very fair fight at all…. Because the light novels or their manga adaptions do not seem to have been translated, I was going to review the manga adaptation of this film. Or rather, the ebook version of the manga adaptation of the film. Each level between the original and me adds to the chance that something will go wrong. In this case, it was being able to preserve the proper aspect ratio of the manga or expand the print to legibility but not both. I did read the first volume, at some cost in eye strain, but eventually came to the conclusion I needed to watch the film instead. Abyss of Hyperspace pushes the space (or in this case hyperspace) as an ocean metaphor pretty hard. Hyperspace has currents and depth; the machines used to probe its depths look a lot like the illegitimate child of William Beebe’s Bathysphere and a mecha. Unlike the ocean, hyperspace turns out to subject to artificially triggered phase changes, a detail that gets used both destructively and creatively. Both Marika and Kanata’s fathers are dead, but that seems to be the only trait in which the dads resemble each other. Gonzaemon was content to leave his child in the care of his ferocious ex-wife Ririka2 , whereas the professor dragged his unwilling son around the empire and deep into hyperspace. Marika had a happy childhood, while Kanata’s childhood appears to have left him with PTSD. Marika has a legion of friends, whereas the closest to a friend poor Kanata has is an annoying robot parrot. It would seem that Marika was lucky to have been raised by her loving supportive mom, whereas Kanata was cursed with a dad comparable to Jonas Venture. Japanese SF seems more open than American to the idea of giving women — girls in this case — lead roles. In fact, the guiding rule sometimes seems to be “everything is better with sixteen-year-old schoolgirls.” There are some annoying instances of pandering to male audiences, in particular, some unnecessarily low camera angles in some scenes. Balancing that, Marika and her friends prevail because they’re technically competent and ingenious3. The result easily passes the Bechdel test. Verdict: the TV series was stronger (IMHO), but this was amusing enough. I should go rewatch the TV series. Bodacious Space Pirates: Abyss of Hyperspace is available here (Amazon). It’s not obviously available from Chapters-Indigo, although the manga adaptation can be found there. 1: Aside from conquering places, it’s not clear what the Empire does. If it takes an interest in people sabotaging the hyperspace routes on which interstellar commerce depends, it does so very subtly. Perhaps they’re counting on the empire being so large that all malign schemes are eventually foiled by sufficiently motivated amateurs. 2: He might not have had a choice, since Ririka casually disposes of an entire unit of mercenaries single-handed. Sorry, make that two units of mercenaries. 3: It may help that team evil is composed of salarymen. I cannot say how well they are being paid, but apparently not enough to maintain their enthusiasm once the implications of “heavily armed pirate ship” sink in. The lead antagonist seems to driven less by duty and more by personal curiosity, at least in the latter parts of the plot.